When native apps finally became available for the iPhone, PocketGuitar was one of the first ones I bought. Having been a guitar player for most of my life, I thought this app was so cool. I was impressed by the way developer Shinya Kasatani mimicked the guitar fretboard and provided various types of guitar sounds (electric, classical, and so on). I also liked how you could choose alternate tunings, do hammer-ons and pull-offs and set up other effects. Unfortunately, this held my interest for all of about 30 minutes. In that time, it became apparent that learning to play even the simplest songs on the PocketGuitar was going to take hours of my life, which I would rather spend playing a real guitar. 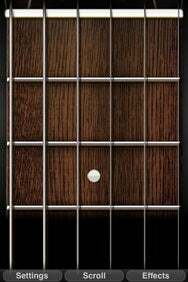 Striking a Chord: PocketGuitar’s coolest feature, an exact replica of a guitar fretboard, is also its ultimate downfall. In my view, the biggest problem with PocketGuitar is that it takes the guitar metaphor too literally. You fret the strings with one hand and strum/pick with the other, just like a real guitar. But because of the size of the iPhone’s screen, you can only access a few frets at a time, and you can’t slide up and down the fretboard gracefully. Even if the developers could fix this, I don’t think it would make much difference, simply because it’s too cumbersome to hold the iPhone in a guitar-playing position. Since then, we have seen the release of revolutionary new apps, like iShred ( ) and BeBot ( ), which are impressive musical instruments in their own right. Where they succeed, and PocketGuitar ultimately fails, is that each starts with a familiar metaphor, but then puts its own multi-touch spin on it, producing an entirely new type of musical instrument. To me, this is what I find most interesting about the iPhone as a development platform. So, if you’re an experienced guitar player just looking for a way to kill some time, then PocketGuitar might be for you. But if you’re a beginner, then skip this app (and the accompanying frustration) and put your money towards buying a real guitar. It’ll be easier to learn, and far more satisfying. PocketGuitar is compatible with any iPhone or iPod touch running the iPhone 2.x software update.